Determined that the students killed in the terror attacks in Garissa not be reduced to a number, a Kenyan social media campaign has set out to tell the story of each individual victim. 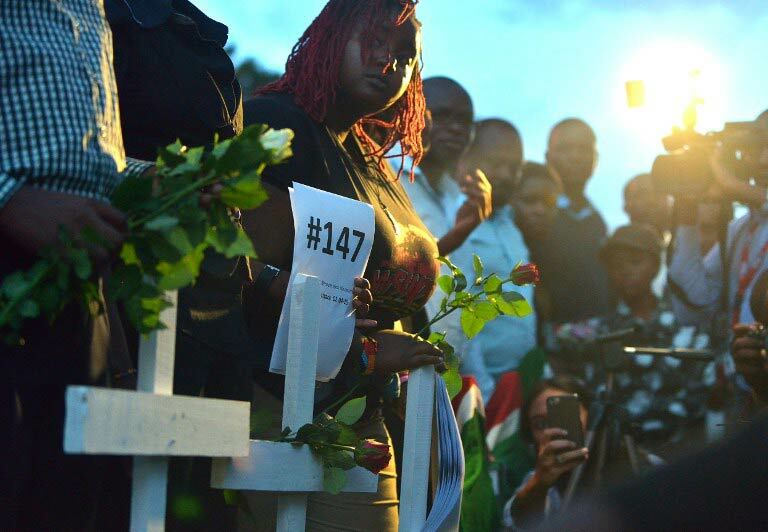 Using the hashtag #147notjustanumber and #theyhavenames, friends and families of the victims, journalists and others on Twitter have begun to honour the lives of those who died – sharing the photographs, names, ages and character portraits as the details become available. Each tweet paints a powerful portrait of loss. They include tributes to Leah N Wanfula, who at 21 was the first of nine siblings to go to university. There’s Gideon Kirui, 22, whose entire family saved up for him to continue his education; and Selpher Wandia, 21, who was studying to become a teacher. They record small details that will be remembered by those closest: Beatrice Njeri Thinwa, 20, was a fan of Kenny Rogers and Mildred Yondo loved theatre, music and mangoes. Official reports say that 148 people died when al-Shabaab gun men stormed a university in eastern Kenya seeking out Christians last week. Most were aged between 19 and 23. Some of the victims honoured on Twitter were also featured in Kenyan national newspaper the Daily Nation on Monday. Ory Okolloh Mwangi, also know as @KenyanPundit, started the campaign on Sunday before the official death toll had been raised to 148. She told the Wall Street Journal that the initiative was “an effort to humanise victims of terror”. According to social media monitor Topsy, the hashtag #147notjustanumber has been mentioned 52 000 times so far. In an effort to make sure each student is honoured a public Google document has been created “to ensure we never forget the names of victims of internal and external acts of mass violence”. It also contains tabs for other al-Shabab victims, including the ones on Mandera Quarry in 2014 and the Westgate shopping mall in 2013. Coordinated by a Kenyan blogger known as Owaahh, the document is acting as an open-source database. The public are asked to add any information they have about the Garissa students, including quotes from family members and personal Facebook pages. Owaahh’s team is also asking for links to source and verify the information collected. It currently lists the details of 71 victims, not all of them are verified. Kenyans on social media have also started to share details of a vigil “to remember and mourn the Kenyans who lost their lives”, which will be held in Uhuru Park, Nairobi. People have been asked to volunteer at the event and those attending to bring handwritten tributes.